Sophisticated yacht owners eventually tire of the Mediterranean and Caribbean fleshpots and start looking for more challenging cruising areas. This explains the growing popularity of long-range expedition yachts with vast storage capacity for food, fuel and water, enabling them to roam the world’s oceans for weeks at a time. 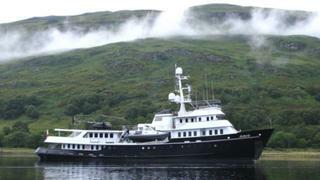 Here we present five examples of world-girdling yachts currently for sale. The 61.3 metre Voyager was built in steel and aluminium by Spanish yard Astilleros y Talleres Celaya to a design by Sparkman & Stephens and delivered in 1973. 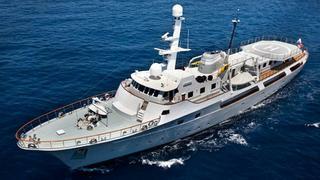 She was purchased in the early 2000s with the purpose of transforming her into the ultimate expedition vessel for charter. Carrying a helicopter with refuelling capability plus a large array of tenders and toys, she was used for extended cruising periods from remote tropical waters to extreme Alaskan winters. Following her sale in 2008, the current owners had the interior completely redesigned in a more modern style, as well as two technical refits in 2010 and 2012-2013. 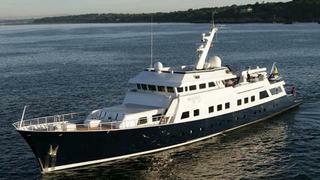 SOLAS classed, she has accommodation for 12 guests in six staterooms. The full beam master suite is on the upper deck and, with a area of 42 square metres, is accessed from a private staircase. Below deck lie two double staterooms with king size beds, two doubles with queen size beds and a twin convertible to a further double. All staterooms have flat screen televisions and full en suite bathroom facilities. In addition, the versatile skylounge can be changed in seconds into a second master suite with a floor area of 44 square metres. An attractive area for guests is the aft upper deck which features a large teak dining table, seating for 14, a barbecue and a wet bar – ideal for al fresco entertaining. Twin 1,125hp Caterpillar engines give Voyager a range of 4,800 nautical miles and, lying in Turkey, she is asking €6.4 million through Ocean Independence. Built by Greece’s Anastassiades yard, the 49 metre Asteria was delivered in 1970 as an ocean going salvage tug. 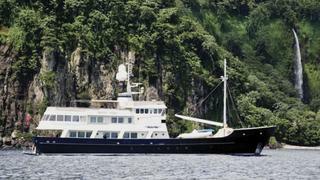 She was converted in 2000/2002 by Northport Engineering in New Zealand into a world-cruising expedition yacht. A large saloon has comfortable seating and a 72-inch 3D television screen with surround sound plus a formal dining area for 12. Accommodation is for 12 guests including a master suite on the upper deck with an adjoining dressing room and a private study. On the main deck, two of the four double staterooms with queen size beds can be converted into twins, and there is a further twin cabin, all with en suite facilities. Her dedicated heli-deck can accommodate medium size helicopters for up to six or seven passengers such as the Eurocopter B3 and B4, and Bell 407. A single 1,850hp Caterpillar engine gives Asteria an enormous range of 6,000 nautical miles and she is fitted with Quantum zero-speed stabilisers. Marketed for sale by Worth Avenue Yachts, Asteria is asking $11,500,000. Built in steel by US yard Nylen, the 46.3 metre Chantal _was delivered in 1984 with a full refit and upgrade in 2013. Formerly named Chantal Ma Vie, her relaxing, comfortable interior is by Lou Benskey of Global Marine and her exterior was styled by James S Krogen. A successful charter vessel, this expedition yacht has three spacious decks, a cockpit, jacuzzi and a wide range of water toys. Accommodation is for up to 12 guests in five staterooms consisting of a master suite, three doubles and a twin plus two Pullman berths, all with en suite bathroom facilities. 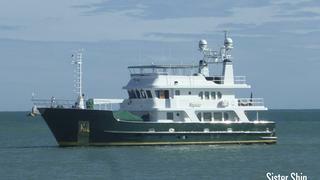 She also accommodates eight crew in four cabins. Chantal‘s twin 650hp Cummins diesel engines underwent a full overhaul in 2014 and she has a trans-oceanic range of 5,400 nautical miles at 13 knots. Listed for sale by Bernard Gallay Yacht Brokerage, Chantal is asking €4.5 million. Custom built in aluminium by famed US yard Palmer Johnson to ABS class, the 46 metre Dione Sky was delivered in 1996 as Turmoil. Under her present owner she made an impressive figure of eight passage around North and South America – a feat recognised by the award of the Voyager’s Trophy at the 2011 World Superyacht Awards. In all, she has logged nearly 200,000 nautical miles since launch and made a successful transit of the North West Passage in 2001. Her rugged appearance belies a stunning, elegant interior in American cherry wood. Dione Sky is MCA compliant and has accommodation for 10 guests in a master suite, two double staterooms and two twin cabins, all en suite. She received an extensive refit/rebuild in 2007. Twin 819hp Caterpillar engines give her a cruising speed of 12 knots and a range of 7,000 nautical miles. Both engines were completely rebuilt in early 2013. Lying at Vilanova Marina in Barcelona, Spain, Dione Sky is asking $13 million through Yacht Connections. The 28.9 metre Impetus was built in steel by Brazilian yard Inace to a design by Michael Kirschstein, and delivered to her experienced owner in 2005. ABS classed and MCA compliant, a cherry wood interior with burl inlays accommodates up to eight guests in a master suite and two guest staterooms, all with en suite facilities. In addition, her large sky lounge can also be used as a fourth queen stateroom, an office, workout area or home theatre. The flybridge is massive and has a full size hot tub, gas barbecue, full bar, large dining table for al fresco entertaining and very comfortable forward navigation seating. Impetus is a proven explorer yacht with several transatlantic crossings, trips to Alaska and a rounding of the horn of South America. A one-owner yacht, she has never been chartered. Twin 450hp Caterpillar engines power her to a cruising speed of 10 knots and a range of 6,500 nautical miles. Listed for sale by All Ocean Yachts, Impetus is asking $6,195,000.